UC San Diego hosted a dedication ceremony at the San Diego Supercomputer Center for the new Halicioğlu Data Science Institute on Friday, March 2. The new institute, named after UCSD alumnus and current computer science professor Taner Halicioğlu, who donated $75 million towards its creation, will serve as a cross-disciplinary hub for students, faculty, and researchers interested in learning about and applying data science to their careers. The dedication ceremony opened with comments from Chancellor Pradeep Khosla about the vision for the institute. The institute will be co-directed by UCSD computer science professor Rajesh Gupta, who formerly served as the chair of the Computer Science and Engineering Department. Gupta will be co-directing with Jeffrey Elman, the former dean of the Division of Social Sciences at UCSD, who is currently a professor in the Cognitive Science department. Following Gupta, was guest speaker Bill Nye, who spoke about his journey as a mechanical engineering graduate, to his career at Boeing, to his media presence and his current job as the CEO of The Planetary Society. 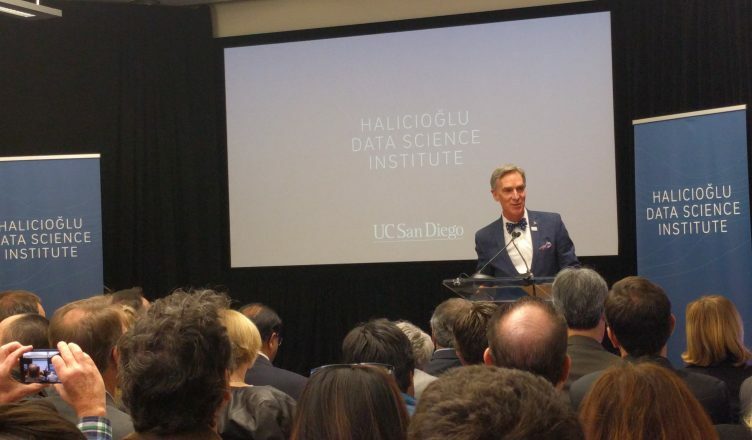 He continued to speak about how the Halicioğlu Institute will change the field of data science. Both Gupta and Khosla echoed Nye’s sentiments about the institute as a hub for all students to access data science in statements to the UCSD Guardian. The long term plans include expanding the number of lectures, professors, professionals, and mentors across various departments. Bill Nye went on to share an anecdote about how he witnessed the Earth’s population change from 2 billion people to 3 billion when he was nine years old, and how the population has more than doubled in his lifetime. Students will be able to access the institute at its initial locations in the San Diego Supercomputer Center and at Atkinson Hall. There are plans to establish other hubs throughout the campus in the coming years.